Denby Pottery's history can be traced back to 1806, and the discovery of a seam of fine quality clay along the route of the nascent Derby - Alfreton Road. Local potter William Bourne, who then had a pottery in nearby Belper, took a lease of the land and in 1809 the Denby Pottery was founded. By 1812, William Bourne's son Joseph Bourne was in charge of the pottery, and rapidly established a reputation for the company with the production of good quality domestic stoneware. High volumes of jars, bottles of all shapes and sizes and many other household and commercial wares were made, and the pottery rapidly grew. As the 19th century progressed, Denby continued to successfully produce an expanding range of domestic stoneware tableware and also gradually introduced a number of decorative items into their output. Often commemorative pieces, these early decorative items were usually simply decorated versions of standard stoneware shapes. Denby gained a reputation as a relatively philanthropic employer, perhaps because of the strong Methodist beliefs of the Bourne family, and became a popular and large local employer, offering good job security and acceptable working conditions, as well as such innovations as a company-backed employee savings scheme. 1898 saw the death of Sarah Elizabeth Bourne, who had run the Denby pottery since her husband's death in 1870. Her place was immediately taken by two of her relations, Joseph Bourne-Wheeler and John Topham. 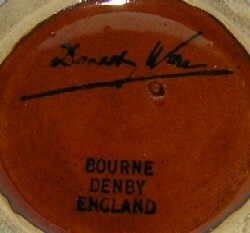 Since the late 1870s, Denby had been taking cautious steps into the art pottery market, and this trend continued under Bourne-Wheeler and Topham. In 1886, the Danesby Ware branding was introduced for the first time, and was to remain in use until the 1960s, appearing as the backstamp on many successful art pottery-inspired ranges. One particularly notable early art pottery collaboration was with Edwin Martin, of the Southall, London-based Martin Brothers pottery. He produced several decorative pieces during a visit to the Denby pottery, with most of these surviving in the Dale family collection. 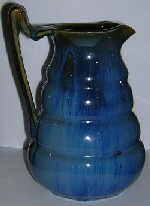 The early 20th century brought centenary celebrations for Denby in 1909, and the continued growth in their output of art pottery, especially during the 1920s, which saw the birth of several decorative tableware ranges, notably the Electric Blue and Saffron Ware series, still highly popular and collectable today. The success of this art pottery was at least in part the result of the creative efforts of Albert Colledge (father of Glyn), who upon his return from WWI was soon promoted to be head of the newly-formed decorating shop, and who was at least partly responsible for the decoration of the Orient Ware and Electric Blue ranges, among others. Both ranges bore the Bourne Denby England and Danesby Ware backstamp marks and featured many original shapes, designed to show off the remarkable glazes then being introduced by Denby. The 1930s forced economic sacrifices on Denby, with staff taking pay cuts and shareholders forgoing dividends as the worldwide recession bit hard. Denby survived the recession with the help of newly-installed and modern Dressler kilns and the enlightened management of Norman Wood, who realised that Denby's creative output must not stagnate during this difficult period, and instituted a policy of recruiting highly-talented freelance designers to produce designs for new ranges. Names such as Donald Gilbert and Alice Teichtner made notable contributions to the diversity of Denby's output, and helped to introduce new creative ideas into the pottery. 1952 saw the lifting of all the remaining wartime restrictions on the manufacture of pottery and revealed a Denby poised and ready for the new decade, with a redesigned and modernised factory and a raft of new creative ideas. The ubiquitous and highly successful Greenwheat range was introduced in 1956, and the years that followed saw the continued success of both tableware and decorative ranges. 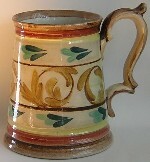 This same period also launched the career of one of Denby Pottery's most notable names, Glyn Colledge. Son of Albert Colledge, on his return from service in the RAF in WWII, Glyn Colledge started work at Denby as a trainee designer working with his father but gradually gained independence and status and was given his own studio, leading to the creation of the very popular Glyn Ware studio pottery range. Each piece was hand-signed and given a functional designation to avoid the high purchase taxes then imposed on decorative wares, and to this day Glyn Ware is one of the more popular and accessible areas of Denby collecting, with pieces available at very reasonable prices. Glyn Colledge went on to design many successful ranges and become a senior and respected member of staff over the years before his eventual retirement in 1983. Today, despite some turbulent times in the 1970s and 80s, Denby Pottery is still thriving, producing popular and high quality table wares at their factory in Denby, having so far survived the temptations and pressures that have led so many other British potteries to either close or offshore their production. Long may it continue. We'd recommend these books if you are interested in finding out more about Denby Pottery. This book link will take you to Amazon. If you make a purchase we will receive a small referral fee.